You're playing in a multiple deck game, and receive a five and a three for a two-card total of eight while the dealer flips a six as his upcard. Standing with this hand is, of course, out of the question. Your decision comes down to whether you're going to hit the hand or double down. Which of these do you do? My best advice as to the correct play is not to double, but to hit the hand. Look - having the eight is really not a strong enough hand to be doubling on. Remember that the average dealer hand comes out to a value of 18.23. So as far as a winning hand is concerned, you're holding something that is actually less than average. Also remember that even with a six as his upcard, the dealer will only bust about 43% of the time. So your positive yield for doubling is minimal since you're only going to win 4% more than you lose. 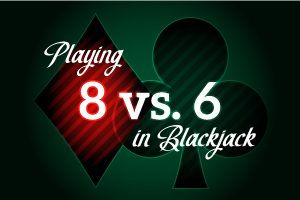 On the other hand, when you hit the eight, you'll win nine more hands than you lose, per hundred. So your gain with simply hitting is slightly greater than if you executed a double-down. Always keep in mind that opinions are not relevant in the game of blackjack. Mathematics matters. Probability takes precedence. Solid basic play is not predicated on the proposition that your "hunch" is going to work this time around. We play the percentages. We don't flinch. We memorize the right way to go and we do it every time.